Greg is a regular American schoolkid, experiencing many middle-school troubles friendships, crushes, successes.. and failures. All of this is presented in a funny and inviting way with exaggurated sketches. Written by the popular American author, Jeff Kinney, this is something not to miss out. It's Greg's summer vacation and Greg just wants to spend it with video games - and sleep. But his mom wants a more social holiday - which Greg and Rodrick do not appreciate. Greg deals with a high-school crush, horror-movie nights, bad comic strips - I think you got the idea..
Not my favourite book, but still, if you want to catch up with Greg's life, this is the book for you. Greg and Rowley are now spending less and less time with each other — Rowley has got a girlfriend and hangs out with her all the time. Greg feels a bit left out — and as a result, he tries to bud up with Fregley. Then, he finds a Magic 8 Ball that helps him find out lots of stuff that he never knew. 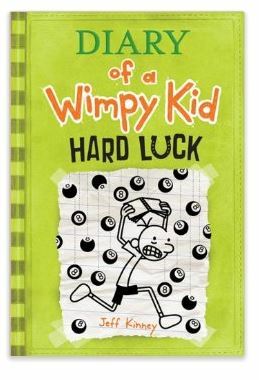 Every Wimpy Kid Diary, we get a bit more information about Greg's past life. And in this book, we get a ton of it! We learn about Tickles, the stuffed animal, Squirm the worm, and the lovely Body Blankie. Greg joins a photography club and becomes the yearbook photographer. I found the book quite good, compared to the other books of the series.